Green electricity finds few customers in Mass. 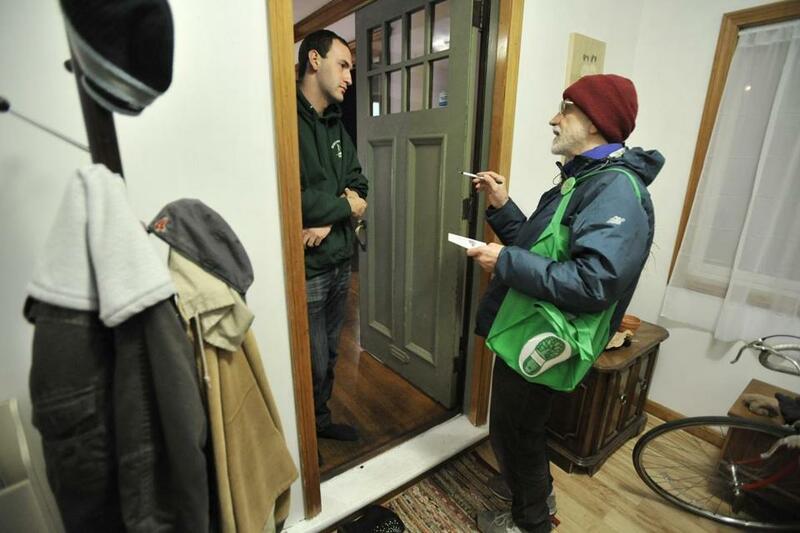 Ed Loechler, right, speaks with Tom Fuchs, 22, about renewable energy programs during a walk-through in his Brookline neighborhood with literature explaining renewable energy programs. Despite publicity, these programs have seen have seen little participation. Five years after NStar became the first Massachusetts utility to allow customers to buy electricity supplied by a wind farm, its Green program has failed to catch on. Less than 1 percent of the company’s nearly 900,000 customers have enrolled. The dismal response resembles lackluster participation in similar renewable energy programs offered by other utilities, worrying state officials as they push toward a goal of generating 20 percent of electricity from renewable energy by 2020. The NStar program has faltered because of the recession and falling fossil fuel prices, which resulted in a greater surcharge for wind energy. Environmental activists are frustrated and question whether utilities have done enough to publicize the programs. Ed Loechler, an activist from Brookline, knows first-hand the challenge of trying to persuade people to put their money where their environmental ideals might be. For several years, the Boston University biology professor has been going door to door in his neighborhood to plug the NStar program. When a door opened one night last week, he urged a young man to sign up. “This is the single, simplest way you could cut a lot of carbon dioxide from your household,’’ Loechler said. But after he explained that enrolling would add between 15 percent and 30 percent to his neighbor’s electric bill, the 22-year-old thanked him for promoting what sounded like a good idea. “But it’s probably too much,’’ the man said. When NStar announced the program in 2007, it launched a public relations campaign that included billboards, advertisements on their trucks and website, bill inserts, and significant media attention. Utility executives explained how their customers would be able to buy half or all their power from wind farms in Maine and upstate New York, for up to 7 percent more than they would pay for regular service that came from such energy sources as coal and natural gas. Generating electricity from such fossil fuels releases carbon dioxide into the atmosphere, which scientists say contributes to global warming. NStar signed two 10-year contracts to buy 60 megawatts of power, enough to power tens of thousands of homes and small businesses, or 2 percent of the utility’s overall demand. At the time, NStar chief executive Thomas J. May said he hoped the program would be oversubscribed and that the company would have to buy more renewable energy. 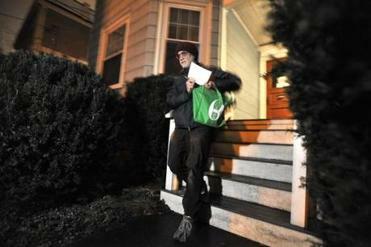 Loechler leaves a house after dropping off brochures explaining renewable energy programs available from utility companies. What May and other executives didn’t expect, however, was that the price of dirtier fuels would plummet. The premium charged for the Green program also dropped, but not as much, making the wind energy relatively more expensive. NStar eventually had to ask the state for permission to raise its rates for the Green program to break even. 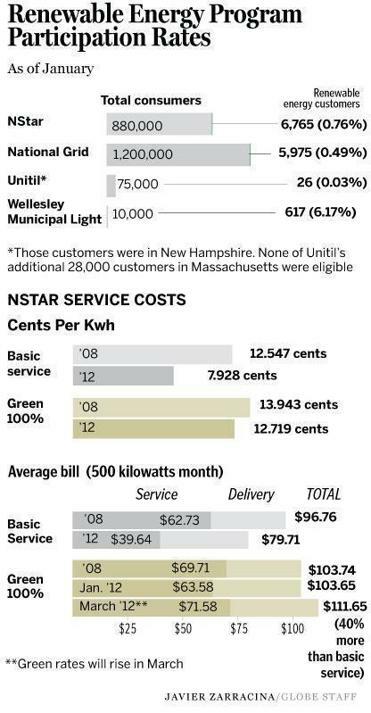 “As prices for traditional power fell, leading to a corresponding drop in the basic service price, the Green premium had to be increased to continue to cover costs,’’ said Michael Durand, an NStar spokesman. The program met expectations in the beginning, as about 8,000 customers signed up in little more than a year, Durand said. The company had hoped to enroll 10,000 customers within the first two years, but enrollment fell. Today, with fewer than 6,800 customers in the program, a typical family buying all its power from the wind farms pays about $23.94 more per month than a basic service customer, or about 30 percent extra when delivery charges are included. Those rates will increase again in March by $8 for customers buying all their power from the Green program. “We wouldn’t want to speculate why participation hasn’t been more robust,’’ Durand said, noting they have enough wind farm capacity to support three times the number of customers now enrolled in the program. State officials say they saw the NStar program as a potential model for other utilities, many of which have allowed customers to buy so-called renewable energy credits that indirectly subsidize the cost of other companies building anything from solar stations to hydroelectric plants. Those other companies have had similarly poor results in gaining participation in their green programs. Since launching in 2003, National Grid’s GreenUp program has attracted fewer than 6,000 of its 1.2 million customers. Unitil, which began offering its renewable energy credit program in New Hampshire two years ago, has enrolled only 26 of its 75,000 customers there. “It just appears people aren’t interested,’’ said Alec O’Mera, a spokesman for Unitil. In Massachusetts, Commissioner Mark Sylvia of the state Department of Energy Resources said he saw NStar’s program as a way to help the state increase the amount of electricity generated from renewable energy, now 8 percent. His colleagues at the state Department of Public Utilities last week hosted a meeting with utility executives to discuss how to boost consumer interest and make their renewable energy programs more accessible and easier to understand. Some environmentalists argue that NStar hasn’t done enough to promote its Green program and suggest the company was more interested the good publicity of appearing to care for the environment. 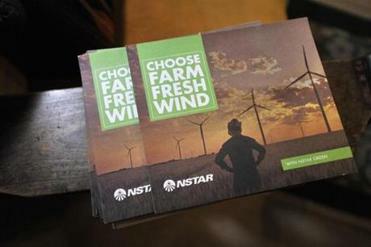 A brochure provides details of NSTAR’s renewable energy options. State Representative Frank Smizik, a Brookline Democrat who chairs the House Committee on Global Warming and Climate Change, also criticized NStar. NStar’s Durand said it was normal to scale back publicity after the launch of a program. As Loechler knocked on doors last week to spread the word about the program - he has no affiliation with NStar other than being a customer and an advocate for renewable energy - he met mainly blank stares and polite rejection. He blames NStar, calling language about the Green program on the website “baffling, loquacious, and obtuse.’’ But he continues to promote the program. At the final home he visited last week, Loechler found a receptive ear in Deborah and Archon Fung, who said they had been discussing how to reduce their carbon footprint with their children. They were surprised at the cost of the program, but have decided to get half their power from wind energy. “I do care about global warming, and it’s probably the right thing to do,’’ Archon Fung said.